The sister of jailed Saudi blogger Raif Badawi has been arrested by authorities in that country, Amnesty International said Wednesday. Samar Badawi, a prominent women's rights advocate, was arrested earlier this week, according to the rights group. Her brother has been in a Saudi jail since 2012 for his criticism of the regime. He was lashed 50 times in 2015. Raif's wife, Ensaf Haidar, and their three children became Canadian citizens earlier this summer. They live in Quebec's Eastern Townships. Haidar has repeatedly pressed the Canadian government to increase its efforts to get her husband released. Samar has been targeted by Saudi authorities before. She was subject to a travel ban in 2014 and was arrested two years later, Amnesty said in a statement. Also arrested this week was Nassima al-Sada, another women's rights activist and an advocate for Saudi's minority Shia population. "The international community must push Saudi Arabian authorities to end this draconian crackdown and targeted repression of human rights activists in the country," Amnesty's statement said. 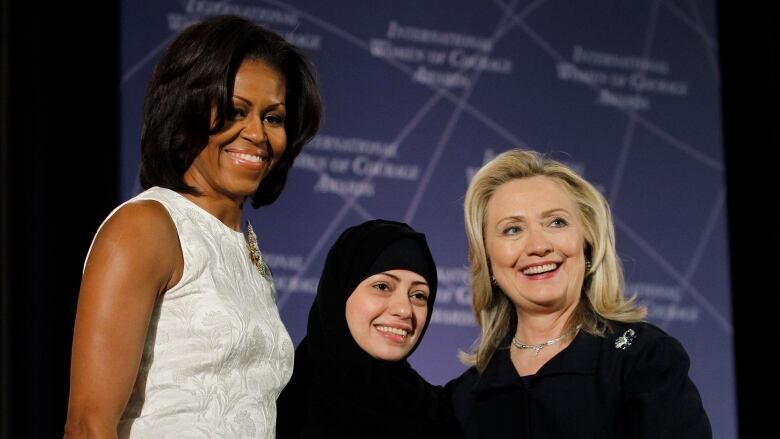 More than a dozen women's rights activists have been targeted since May in Saudi Arabia. Most campaigned for the right to drive and an end to the kingdom's male guardianship system, which requires women to obtain the consent of a male relative for major decisions. The arrests are at odds with the progressive image the government has projected this year under Crown Prince Mohammed bin Salman. Saudi government spokespeople did not immediately respond to a request by Reuters for comment on the latest reports. Canada's Minister of Foreign Affairs Chrystia Freeland tweeted out her support for the family on Thursday.